Here at Milestone we pride ourselves on providing dedicated, highly qualified and experienced educators who have been at the centre for many years. Our educators are warm, affectionate and compassionate and are always available for children and families needs. Whether you have queries or concerns about your child’s experience in care, their development, or things happening at home, our educators are more than willing to share their time, knowledge and support. All of our educators work collaboratively to improve practice and relationships through regular team meetings and professional development training. They are willing, open and excited for change and are proactive in providing the children with new and engaging play spaces. The relationships we foster with our families and the local community is of the highest priority. Family participation is always welcomed and encouraged across all aspects of our program. Our educators value ideas and contributions from families, and part of our aim is to make your family feel that this is a home away from home. 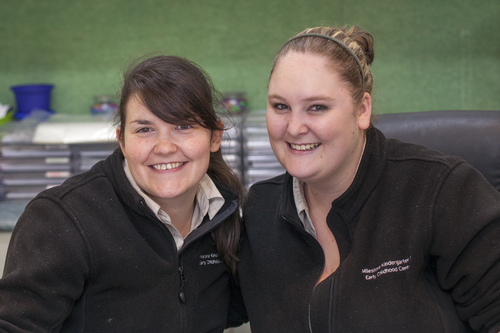 Our management team is comprised of Alyssa Wright, our centre director, and Lisa Pollard, our centre's second-in-charge. Alyssa has been working at Milestone since February 2005, back when it was named Charlie Brown's Child Care Centre. She started out working as an assistant in the pre-school room before gaining her Diploma in Children's Services and becoming the qualified educator in the nursery room in 2007. Alyssa became second-in-charge of the centre in early 2009 and in December of the same year was appointed to the centre director role. Since becoming the director, Alyssa completed her Advanced Diploma in Children's Services in 2011. As director of Milestone, Alyssa oversees 30 hard working educators and 200 families each week. Lisa has been an assistant at Milestone since October 2008. She began her time at Milestone as the assistant to a child who had special needs. Over time she became a toddler room assistant and then moved into the pre-kinder room where she is currently a permanent lead educator. Lisa was offered the second-in-charge position in early 2011. She has been in charge of the centre during Alyssa's absence on many occasions, including one 6 week block that involved our assessment and rating visit.